After a hugely successful 14-date UK and European tour in 2011, and having just returned from playing at the Volvo Ocean Race in Abu Dhabi, The Straits will be heading out on an 18-date European tour in March 2012. The Straits are comprised of former Dire Straits members Alan Clark (keyboards) and Chris White (sax, vocals), plus world-class musicians Steve Ferrone (Tom Petty’s drummer), Terence Reis (lead vocals, guitar), Mike Feat (bass), Adam Phillips (guitar) and Jamie Squire (keyboards, vocals). 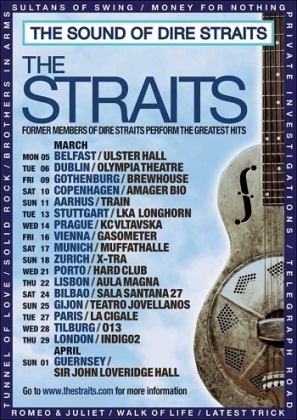 The Straits will perform for one night only in the UK, at London’s indigO2 on Thursday 29th March. The forthcoming European tour is a direct result of the overwhelming demand to hear the band’s much loved catalogue of unforgettable songs. The Straits will perform songs from the classic albums Dire Straits (1978), Communiqué (1979), Making Movies (1980), Love Over Gold (1982), Brothers In Arms (1985) and On Every Street (1991). Experience the unforgettable classic songs - Sultans of Swing, Romeo And Juliet, Tunnel Of Love, Private Investigations, Money For Nothing, Walk Of Life, and Brothers In Arms.